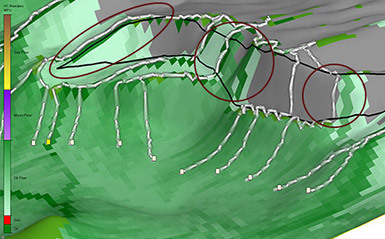 Better understanding of the uncertainties in complex geology, developing new stochastic approaches and producing high resolution 3D models – these are some of the goals in our new R&D project MigriComplex. Since 2009, the Migri simulator has been in daily use in case studies, including both license studies and license application work. The feedback from Migri clients has been important in making the software stable and ready for production use. The needs and wants of our clients have also been important when deciding how to further develop our technology. The development of Migri has been performed as a series of research & development projects. In the 3-year period from 2015 to 2017, Migris has taken on a new and challenging development project: MigriComplex. We have been working with our three sponsor companies ENI, Statoil and Tullow Norway, and received important financial contributions from Innovation Norway. The MigriComplex project aims to solve exploration challenges that exist in complex geological systems by modeling the hydrocarbon migration within the systems at geological times and at high resolution. The topics addressed include charging of complex faulted systems and high-resolution primary migration within source rock systems. The project objective is to adapt the existing Migri technology for use with complex geology in order to study uncertainties of the petroleum charge; and to develop and incorporate new stochastic approaches for use with complex geological systems. The basis for the Migri approach to fault seal modeling is a unique mesh system that combines regular mesh elements away from complex structures with irregular mesh elements where complex structures such as faults are present. This methodology will be further refined in the MigriComplex project, to allow for building complete 3D structural models which also include the fault surfaces (zones). These models will then be used for simulating the flow along and across the fault surfaces and into older and/or younger permeable carrier units. This figure shows oil migration up towards and within a fault surface. The white lines trace the flow-paths through some of the most important migration stringers. The red circles show areas where oil is modelled to migrate up the fault surface. The MigriComplex project will allow us to model cross-fault migration into older reservoirs and carrier stringers on the hanging-wall side of the fault. It will also model migration further up the fault surface into shallower carriers. All will be controlled by probabilistic fault seal parameters, which will allow for finding alternative solutions and computing risk factors for each of the fault surfaces. The high-resolution primary migration model will be able to make use of high-resolution models of source rock properties (down to meter scale resolutions) combined with high-resolution overpressure models to transport the generated volumes out of the source rocks and into the carrier rocks. Studying complex 3D petroleum systems models requires advanced stochastic analyses techniques, and the project will further develop the techniques that were launched in the completed Migrisk project. Some of the stochastic techniques being used in the MigriComplex project will be discussed in the April 2016 AAPG Hedberg conference. We plan for running the first test case studies in 2017, with the resulting software being put into early production stage in 2018. Questions about the project? Contact us.